Our patio heater hire is the best option for heating open air parties and events standing at 2.4m in height. Remember, it is best to place it in the middle of an area you want to heat as it radiates heat 360 degrees. The standard patio heater hire comes complete with a full 9.0kg Gas bottle that lasts for approximately eight hours. If you need more gas, then let us know. The patio heater is finished in stainless steel. 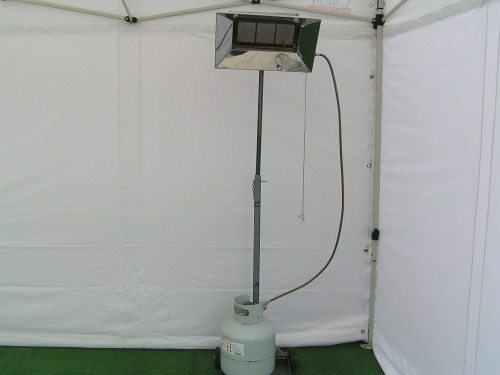 This is the most common outdoor heater hire option that our clients use. If you want to order one or many, simply contact us today. The Gas Radiant Heater is a great option that can be used in marquees and patio areas as it does not have the same clearance requirements as the patio heater. This outdoor heater hire option comes complete with wheels so is easily moved and comes with a full 9.0kg gas bottle for the use with it. The J25 gas blower heater is a high output fan forced heater ideal for heating large areas such as marquees, garages and sheds. For a blower heater to be effective you need to have at least three walls and one fresh air opening, as a blower heater is such high output the best way to run them is in short bursts. The blower heater comes with 2 full 9.0kg gas bottles for the use with it and requires 240 volt power. If you need advice about any gas heater hire service we offer, contact us today. If you are hiring an indoor or outdoor heater and want to be sure it lasts, then why not get an extra LP Gas Cylinder with it. If you are not sure about how long different heaters will last, then just ask us when your rent one and our staff can give you the right advice. We want our clients to have a stress free heater hire service, and an extra gas cylinder and take some worries away. There’s nothing worse than feeling the cold is there? Instant Party Hire have your outdoor heating hire needs covered and can deliver reliable heating solutions for your next party or event. Whether your needing to heat a marquee, a garage, pergola, or just an open courtyard Instant Party Hire offers a wide range of outdoor gas heater hire solution that will certainly fit your needs at an affordable price. All our heaters are of a commercial grade and of a very high quality, including patio heaters, radiant heaters and the new jet blower heater option. They all require minimum maintenance and are all meticulously checked after each rental. So you and your guests can just enjoy the warmth throughout your whole event. Need to hire heaters for longer than a day? Regardless of which environment your event takes place, we can tailor a hire solution to your needs. So call us today to discuss your outdoor heating hire needs.